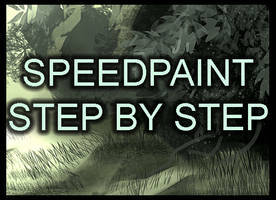 Just did a quick step by step for my normal sketching process on photoshop. This image is by no means a finished piece because i usually only spend about 30- 60 minutes on a sketch like this. I do tend to do alot of these quick sketches normally just to build on an idea, concept im designing or they can just be roughs for a production painting. What brush do you use to paint? Holy crap, you make it sound so easy! Thanks very much for sharing this!!! 30 minutes?? Dang. It's stuff like this that inspires me to keep practicing my digital painting Thank you for the tutorial! Can someone please look at my journal? points, drawing,-anything.Sorry if I spammed.It is just I waited for a couple months to find out what site people used for speedpainting.I finally found it, but I don't know how it works at all.Can someone please explain it?I need help. i confused... How do you acually DRAW?? ?I open every page!Someone Peez help? Calm down. First, find something to draw. Something Inspiring. 2. concentrate on you objective. The objective is to paint well. You don't actually speed through it. It takes time. Its called speed paint because its on a computer. Keep your mouse steady and find new creative way to make it. Lol. Thank you! ^U^ It helped a lot! Thank you for uploading this! I found the perspective lines a great lesson and really useful! I imagine if you gave me the task to draw this, then I would spend ages on the clouds but it would look horrible and like a big blob in the middle of no where .. Ah well! (: This is going to help me amazingly. I hope you wont mind me using to refer to for future use and when I do my GCSE Art? Have a good day and a beautiful piece of work this was!! This tutorial is really helpful! Thanks for it. I can't do that! no matter how many times i try I cannot get this simple concept. 30 mins wow 0_o.... epic beyond words! Thanks for the tutorial! so how do u go about with the painting itself. do you like set your brush to a low opacity and just go over things in the same layer (depending on what it is say, background in one layer, character in the other.) or all in one layer? Fantastic, I'll definitely try it out. This is incredible. Is there a place where I can download Speedpaint? What drawing thing do you use, btw? Thanks man, you really helped me understand a lot of techniques you use, and put my drawing skills to a new level! So speedpaint "films" you as you paint, right? And can you use it on photoshop? how do you see the tutorial?